Holy crap! These dudes are flying around with jetpacks. You can pretty much call them the real-life Rocketeers. 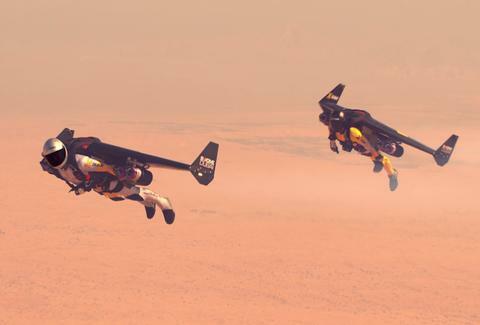 Guinness Record holder and former fighter pilot Yves "Jetman" Rossy and Swiss aerobatics champ Veres Zoltan hurled themselves out of a helicopter on Wednesday wearing winged jetpacks, and proceeded to perform some seriously bonkers aerial stunts above the desert in Dubai.